Get Your Bet Returned if it runs 2nd or 3rd! The Albury Cup is a Listed race held at Albury Racecourse each year over 2000m. The Albury Gold Cup is apart of a two day carnival and has been recognised as the ‘Most Popular Country Feature Race meeting’ in New South Wales on several occasions. The Albury Cup is at Listed level and boasts a total prize pool of $180,000. The 2019 Albury Cup will be run on Friday the 22nd of March, 2019 at Albury racecourse. 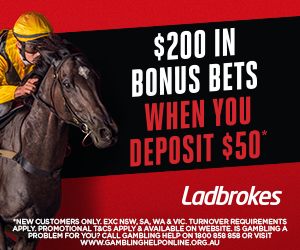 Have you backed our Best Bet 'Ambitious' and want to know how you can watch the 2019 Albury Cup? The Albury Cup is scheduled to be run at 4:10PM on March 22, 2019 so sign up to any of the compatible online bookmakers below and stream the race for free! View the table below to work out which online bookmaker will live stream the Albury Cup.